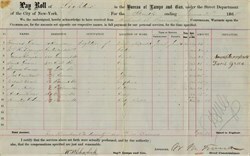 Payroll list from the Bureau of Lamps and Gas of New York City dated in 1868. This historic document is hand signed by the Supervisor, Bureau of Lamps and Gas and by the street commissioner, William "Boss" Tweed, and is over 143 years old. This historic document has been folded and has some wear (the scan makes it look worse than it is)but overall it will look great framed. William Marcy Tweed, 1823-78, was an American politician and Tammany leader. Boss Tweed controlled nominations and patronage in New York City Democratic politics after 1857 through his control of the TAMMANY organization. Tweed started out as a bookkeeper and volunteer fireman in New York City. He was elected alderman (a member of a city's legislative body) in 1851, and later he was also elected to a term in Congress. By 1870, he was so powerful and had so many of his friends (known as his "Tweed Ring" cronies) in political positions that he was able to pass a new city charter allowing him and his friends to control the city treasury. Between 1865 and 1871, Tweed and his associates stole between $30 million and $200 million from the city. He and the notorious Tweed Ring, which consisted of Tweed, the mayor, the city comptroller, and the city chamberlain, sold political favors and defrauded the city largely through padded construction contracts. Jay Gould and James FISK were business cronies. After the Civil War, the warring factions of the local Democratic Party became united behind the leadership of a pro-union Tammany Hall leader named William M. ("Boss") Tweed. Boss Tweed had the legislature authorize a City charter which gave the City government more autonomy and home rule. Understanding the value of public works, he actively sought rapid expansion of the City's physical infrastructure, extending streets and sewers to most of Manhattan on the East and West sides of Central Park and the sleepy, farming village of Harlem to the North. While political corruption had been a problem in the Democratic party since its founding, the activities of Tweed and his associates went far beyond the petty graft of his predecessors, and soon could not be ignored. The New York Times, then a Republican paper, began raising such impertinent questions as how Tweed could afford a town house on Fifth Avenue, an estate in Greenwich, all on his $2500 a year Street Commissioner's salary. Times cartoonist Thomas Nast mercilessly attacked Tweed in political cartoons. The Tweed scandals were a great blow to Tammany Hall, the Democratic Party, and more generally to the NYC. The City's home rule charter was quickly revoked and its ability to govern itself was hampered for the next sixty years. And Democratic reformers for the first time beat the machine. However the reform movement could never hold on to govern mainly because it came from two dramatically opposite factions 1. Wealthy businesses seeking to reduce taxes. 2. Social and labor reformers seeking to increase social services and business regulations.